What's a Dominant 13th Chord ? A triad is formed with a root (1), a third (3) and perfect fifth (5). 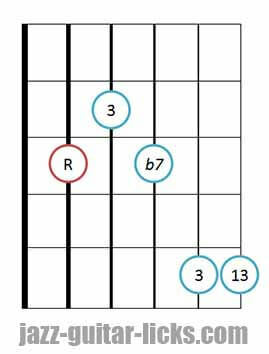 Adding a third to this triad gives a dominant 7 chord (1, 3, 5, b7). 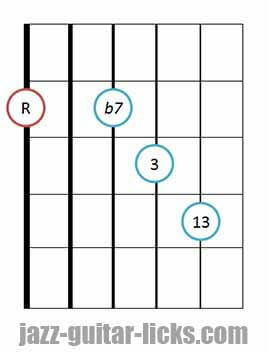 Adding another third to a dom7 chord gives a dominant ninth chord (9). Just add another third and you get a dominant eleventh chord (11) and a last third gives you finally a dominant thirteenth chord (13). In this stack of tones (the 13th chord), the interval 3-11 (E-F for C major) is considered as dissonant so generally the 11 is omitted to avoid this dissonance. It is better to not skip the third nor the 7th, since this would spoil the color of the 13th chord. The 5th can be skipped, it is not the most interesting and important note in this chord. The root (1), when played by the bass player or the pianist can be omitted. 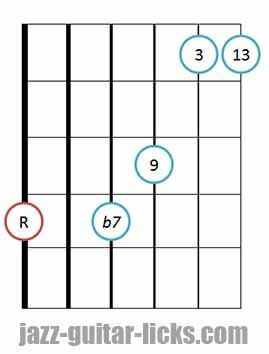 So to play a dominant 13 chord on the guitar, a normal voicing would be 1-3-b7-13. However, the 9th could possibly be added. That is a frequently asked question indeed, it is important to differentiate between 3 and 13 chords. 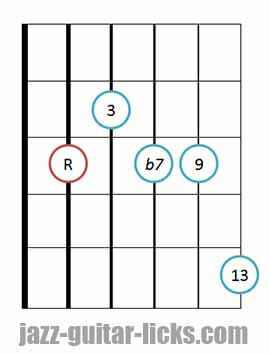 Generally a 13 chord refers to a dominant chord that contain an added 6 in the upper structure, in other word a 13. 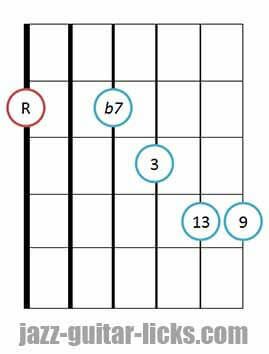 Whereas a 6 chord is a major triad with a supplementary sixth (6). C6 is a four-note chord built with C E G A respectively root, third, fifth and sixth. C13 is a seven-note chord built with C (root), E (third), G (fifth), Bb (minor seventh), D (ninth), F (eleventh) and A (thirteenth). The two guitar diagrams show how to arpeggiate dominant 13 chords. The shape 1 have roots on the sixth and first string whereas the shape 2 have roots on the fifth and first string.